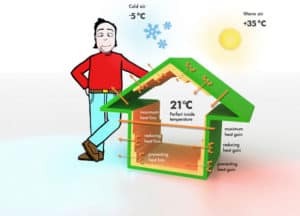 There are three types of wall insulation you can choose to insulate your home. Ideally made up of glass wool, polyester or maybe cellulose fiber, the batts are basically a form of bulk insulation for home. There are endless air pockets present which are trapped inside. These air pockets are responsible for providing excessive thermal resistance. • It is designed to fit perfectly and tightly into the wall cavities and this makes it quite efficient by nature. • It is an environment-friendly product as it is made up of recycled materials. • The air pockets that are present provide good sound insulation. • It is highly a cost effective solution that you can look up to.